Summer is here and there are so many interesting and fun events happening in and around Pasadena and San Diego over the next several weeks. For arts, music, sports and entertainment enthusiasts, following are several upcoming events in both Pasadena and San Diego. Sullivan, Workman & Dee wishes everyone a safe and memorable summer! 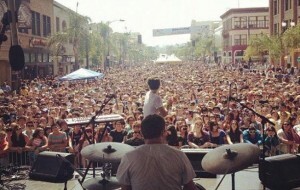 Pasadena’s annual Make Music Festival is the largest free music event on the West Coast. Saturday, June 11, the Make Music festival will feature five main stages throughout downtown Pasadena with many satellite stages at various restaurants, bars and businesses in Old Pasadena and the Playhouse District. The all-day music festival is attended by an estimated 50,000 people. More than 150 bands play an eclectic mix of music from seasoned award-winning performers and emerging hometown talent. The festival takes place Saturday, June 11, 11:00 am – 11:00 pm. 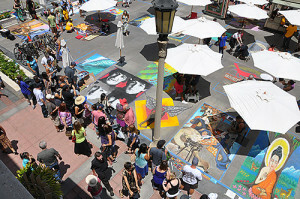 Father’s Day Weekend, June 18-19, marks the 24th Annual Pasadena Chalk Festival at Paseo Colorado. Over 600 skilled chalk artists from all over the world come together to celebrate this unique art form. The festival offers visitors an opportunity to experience art on Paseo Colorado’s famous plaza for free and the two-day festival is open to the public. Art will be on display throughout the weekend, 10:00 am-7 pm. Paseo Colorado, 300 E Colorado Blvd., Pasadena, CA 91101. 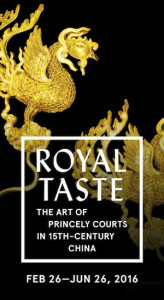 Don’t miss the The Royal Taste Exhibit through June 26 at USC Pacific Asia Museum. It’s a look into the opulent lifestyles and religious traditions of courts during the early and mid-Ming China Dynasty (1368-1644). There are more than 140 works of pictorial, sculptural and decorative arts revealing the palatial lives, religious patronage and afterlife beliefs of the time. USC Pacific Asia Museum, 46 North Los Robles Avenue, Pasadena, CA 91101. There’s no better place to catch the San Diego Padres than on their home turf at Petco Park this summer. The San Diego Padres and the city of San Diego are proud to host the 87th MLB All-Star Week July 10-12, 2016. Between now and then, check out the game schedule here. The Big Bay Boom July 4th Spectacular! The Big Bay Boom July 4th fireworks show promises a spectacular display over San Diego Bay. Fireworks will be discharged simultaneously from barges placed around the bay off Shelter Island, Harbor Island, Embarcadero North, Seaport Village, Embarcadero South Marina Park and Coronado Ferry Landing. The choreographed display will last approximately 17 minutes. 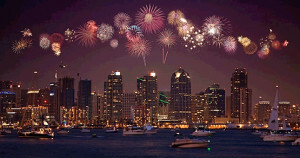 Come down to the bay and enjoy the biggest fireworks show in San Diego. Fireworks will begin at 9:00 pm and the event is free. More than 100 of the world’s best female surfers will compete at the Supergirl Pro event July 22-24 at Oceanside Pier. This event is the largest female pro surfing contest in the world and will feature reigning Supergirl champ Sage Erickson and former champs. The Festival Village includes a food truck experience, live concerts, a beer garden, half-pipe skateboarding exhibitions from X Games pros, the Supergirl Surf Film Fest, free hairstyling by Paul Mitchell, celebrities and more. This is a free event.